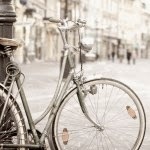 I Love belonging to a CSA.For anyone who doesn't know what a CSA is it stands for Community Shared Agriculture. You basically pay for a share of a farm and get fabulous fresh produce every week. I am so happy to ramp up my families produce consumption for the twenty or so weeks during the year that we participate in the CSA. 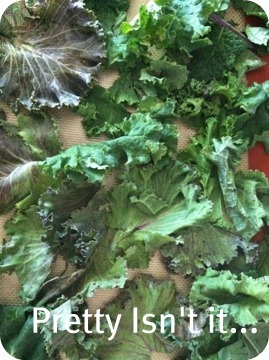 The one problem I have every year is what to do with all the Kale? I have been making stir fried greens and collard greens, but really I get bags and bags of this beautiful Kale and I just didn't know what to do, until now. 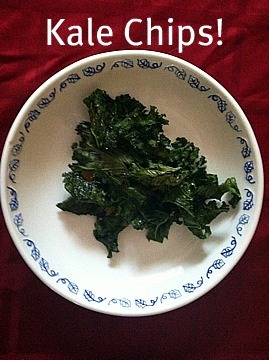 I have discovered the joy of Kale Chips! First cut the stems out of your Kale and lay them on your baking sheet. Oh yeah preheat your oven to 350 degrees at this point. 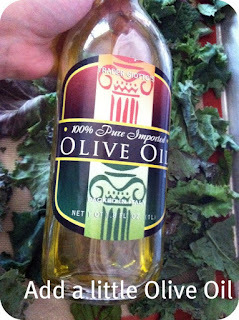 Next you will want to drizzle the kale with olive oil and sprinkle on some salt. 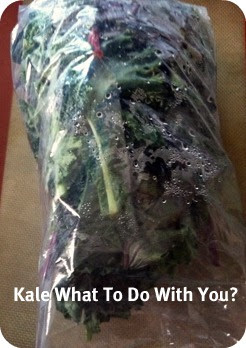 I don't have exact measurements, but don't over saturate the kale. 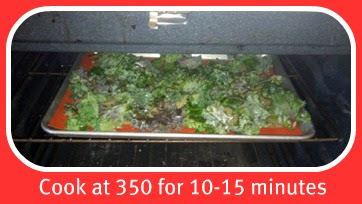 Place the Kale chips in the oven for 10-15 minutes. you want them to dry out and brown a little on the edges. Did I mention they are only 58 calories a serving? Yeah that is right!